Rainy days doesn't have to be boring. Imagine a romantic stroll on a misty evening, enjoying the beautiful twinkling lights of the city. 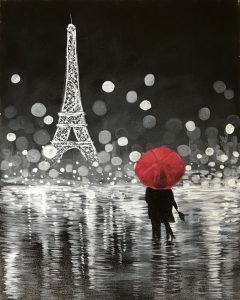 Relax and enjoy an evening painting while sipping your favourite wine. You may change the umbrella to any colour you want.